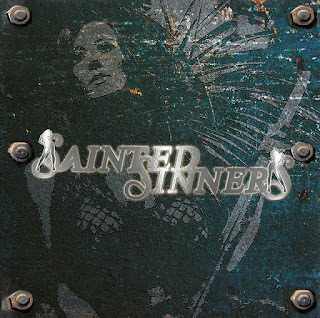 Sainted Sinners release their self-titled debut album. Fronted by the unique, much travelled (but still got it) soul-driven voice of American born vocalist David Reece (ex-Accept) and highly gifted guitar player Frank Pané, they are completed by legendary keyboard player Ferdy Doernberg (Axel Rudi Pell) and the dynamic rhythm section of the two former Purpendicular members Malte Frederik Burkert (bass) and the Hungarian drummer Berci Hirleman. My own dalliance with Reece only is a ‘toe dip’ into his back catalogue with Reece Kronlund, and for me in particular, one of the highlights of the early 90’s, Bangalore Choir’s debut. Now then, if your idea of ‘rock’ is served with a huge slice of ‘classic’, then you need look no further than Sainted Sinners. If you’re of a certain age then the sound of a Hammond will make parts of your anatomy tingle like they used to in the 70s and 80s. I’m a sucker for a Hammond organ (oo-er! F’narr!) and SS has it in bleedin’ abundance. That much so, it should have its own credit in the sleeve notes. Recce, Pané, Doernberg, Burkert and Hirleman have clearly struck gold here. Their love of all things classic has come to the fore in one belting little diamond of an album. They all have their both feet planted in their love for the classics -from Purple to Zeppelin, and from Rainbow to Whitesnake – its all done with an admiration of the great era of the past, than a blatant plagiarism, all with a modern twist. I don’t know why, but I just wasn’t expecting this to be so damn good! !